Last Friday at SLC International Airport, I sat down to write an eulogy for the very average Mr Wainwright. Someone ought to do it, I thought. There was no doubt in my mind that Wainwright was dead. After all, Falstaff reached Delhi on time with all bags intact, didn't he? It stands to reason that Wainwright died. But I was mistaken. We all were. Mr Wainwright, I am glad to inform you, is alive and well. Why, just last Friday afternoon he spent three hours watching NASCAR races at a neighborhood bar in Greensboro, SC. While MR spent the same three hours sitting on the runway in Newark, NJ waiting for her flight to take off. You see Wainwright's life isn't really tied to Falstaff's flights being on time, it is tied to MR's travel plans working out as planned. Almost every time Falstaff's flights were delayed, it was really MR's travel plans that were in jeopardy. So Wainwright is alright. Just that MR, Bill and I got a very late start on our holiday plans. Woke up and realised that we were in Pocatello, Idaho. Apparently we drove here yesternight from Salt Lake City. Bill walks around the room claiming that he is in love with Idaho. Look out of window, Idaho State University campus. Go Bengals everywhere. No wonder Ohio and Idaho are Bill's favorite states now. I assure her that yes, the only things she's missing are tents and sleeping bags which we most definitely need but maybe we can pick them up at the park visitor center? MR looks skeptical. An hour later we get out of the hotel and have breakfast at the nearest IHOP which happens to be in the same strip mall as Macy's. No Macy's in Chicago, IL but there is a Macy's at Pocatello, Idaho. Soon, we are on our way to the west entrance of the park. Before us, the horizon opens up its welcoming arms, the famed potato farms of Idaho stretches out on either side, the mountains behind them watchfully guarding them. The road is so straight that it could put the highways of the midwest to shame, and we peacefully cruise along at 90 miles/hour. 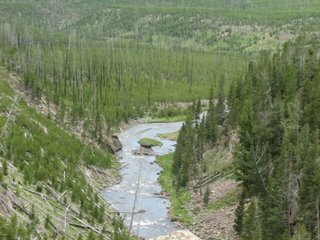 After Idaho Falls, the potato farms give away to pine trees and the highway starts curving as we enter the Targhee National Forest. Up a steep mile-long stretch and down again, and we find that the trees have receded from the sides of the road. They are all the way back by the mountains, and stretching out on either side now are expansive, green meadows. Bill: Though I guess this is not what I thought this place will look like. MR: Me too. I was thinking this place would be all parched with just sulphur pools. Me: Agree but we aren't at the park yet. So maybe it will change. Bill: This is so green and so big! This is like a Disney movie. Bill: Well, you know how in the Lion King type movie, you see meadows like this extending all the way to the horizon. MR: You see this and you think of a Disney movie? Up and over the Targhee pass and the state border, past the small town of West Yellowstone, MT and we find oursleves at Yellowstone National Park. A small river on our right, huge mountains on our left with trees, but no leaves. We stop for some pictures; a plaque tells us that the wildfires of 1988 burnt the forest down leaving only the stumps. Wildfires that despite best efforts could not be put out for months. Dickinson says You cannot put a fire out/ A thing that can ignite/ Can go, itself, without a fan/ Upon the slowest night. After a brief stop at the visitor center where we are told 12 times that we should stay on the boardwalk at all times, we drive to Norris Basin which houses a host of geysers including the highest in the world - the Steamboat Geyser. We can smell the sulphur from half a mile away; its like being back in Chem lab. 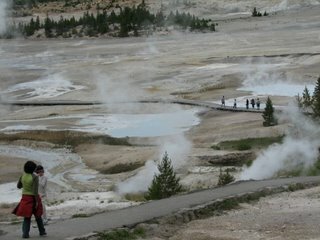 We walk over to the nearest pool which looks like a deep blue jacuzzi spouting sulphur fumes. The earth around the pool is parched and cracked, we read that one can get second degree burns just by stepping on them. 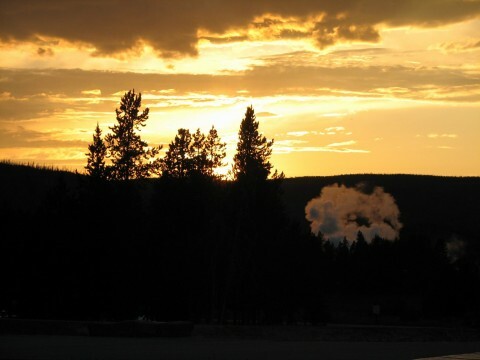 We go over to the Steamboat geyser which when it is in action could rocket scalding water over 300 ft. But since we did not want to spend a lifetime waiting for the boat, we leave to see the other pools in the Basin. Vast stretches of land with smoke arising out every 30 yards or so; it would be Mordor but for the trees in the background. A dying land not yet Dead as Tolkien would have said. We leave Norris Basin and drive towards Canyon Village. The landscape changes abruptly - one minute we are in the middle of arid hot springs with scant vegetation and the next, we are in Ansel Adams territory. Lake Yellowstone, bluer than Tahoe, before us in all its magnificence with snow-capped mountains behind her. 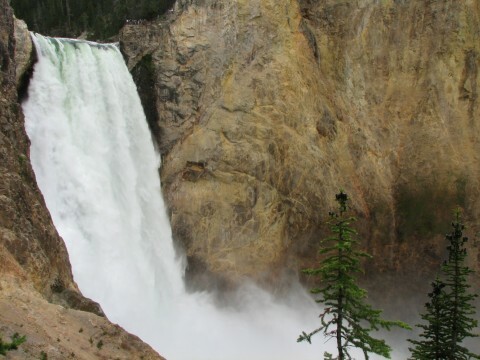 At Canyon Village, we decide to hike down to see the Lower Falls of the Grand Canyon of the Yellowstone. With 328 steep steps and a 410 feet elevation change, it is classified as a strenous hike. In the interests of making good use of MR's hiking stuff, we climb down to see the Lower Falls. It is most definitely worth the climb up. 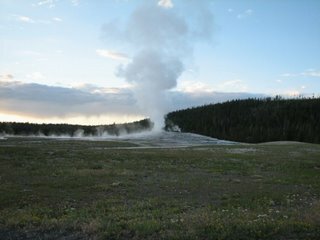 After stopping at Artist's Point so that our staff photographer with her wannabe-SLR camera could shoot some more pictures, we drive to Old Faithful to witness the grand performance. 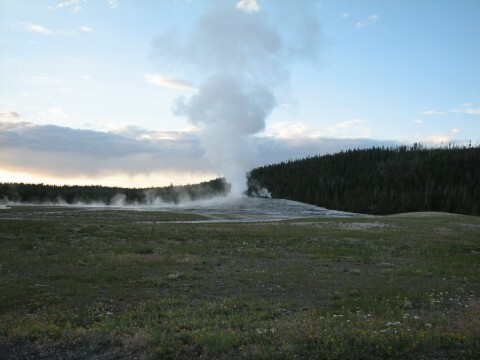 40 minutes to go before Old Faithful's expected to send out water, the Park Ranger tells us. Just about enough time for MR to set up her photo shoot. While Bill and I get dinner, shop for souvenirs and take a walk around the place, MR finds the perfect spot to shoot the geyser from, sets up her tripod and fiddles around with the camera settings. A young, Punjabi couple walk past her. Man: You are so bad. You keep taking pictures all the time. Woman: I like taking pictures. Is that a problem? Man: No, but you behave like a Japanese tourist. Or worse, like some Patel. Woman: You look there. Look at that woman there. See how she is setting up her shot. That is how you take pictures. You wouldn't understand. Yeah yeah, Old Faithful was quite loyal. Here. And a bonus picture showcasing MR's talent. When I pointed out that the sky did not look anything like this that day, I was told that I am too stuck in reality and that true photographers transcend reality. But, of course. Yes, I know Macy's technically own Marshall Fields now. But it still says Marshall Fields okay? Note to Falstaff: Throughout the trip, Bill missed you. But on this particular occasion, when he saw MR and I exchange glances on seeing Macy's, he actually screamed for help. I am quite sure you must have heard that SOS call in Delhi. Now when you see the billboards back home with pictures of MR with Rebel on them along with captions like "This is how you shoot", you know exactly how MR became the role model for trigger happy Punju women all over the world. PS: Yeah, I know. Footnotes, poetry, copious descriptions and making fun of MR n times do not belong here in this blog. But hey, I was just trying to check off at least four things on my cheat sheet on "How to write a long, rambling Falstaffian post". PPS: Falstaff, let me remind you that you asked for this. Veena: A sterling job. I couldn't have said it better myself. There was a point there where I actually checked to see if I was still on your blog and hadn't accidentally switched to 2x3x7. Oh, and Bill has my sympathies. I was wondering what that yell I heard was for. Was beginning to be afraid that the banshees were after me. To be fair, though, I've never known MR to actually take time out from a trip to go shopping. Infinitely long waits / searches for the 'best' restaurant in a 50 mile radius, yes; shopping at Macy's, no. Thank you, thank you. Though a real Falstaffian post would have included all three days in one post - I tried but could not bring myself to do it! Yeah yeah, you wait till you hear where we had brunch the next day. Or have you heard abt it already? strategic placement of Tim Rice, Dickinson and Tolkien : priceless. And regarding the hiking gear .. you have to admit we used every single thing I carried (apart from the camelbak, but then I could very well have used that in the car – v useful when hands are on the wheel). Also, who in their right minds would go hiking anywhere without a towel? Btw, don’t think I told you this – Mr. Wainwright is certainly safe and well. Just to make sure, the weather gods delayed my flight into Houston, because of which I missed my connection to LGA. Thankfully I did end up making it into JFK at 1, as opposed to getting routed onto the 6am flight the next morning (which is what the airline put me on initially – they were clearly uninformed that New York had more than airport). And tell me the truth, was the Dickinson reference yours or BM’s? Ah, Four Seasons. Yes, that would be consistent with MR's idea of roughing it. Did she ever tell you the stories about her trip to Macchu Picchu? How the highlight of the whole trip was this lavish buffet they ended up having lunch at. She even has photographs of it. And before that there was her trip to Bryce, the highlight of which was another meal in another restaurant...you see the pattern. hey .. where are days 2 and 3? didn't you pull sthing like this for your other UT trip as well?? Wait! You're in CA AGAIN? I never thought the time would come when I would be able to say this to you, but don't you ever do any work?